TV show dates: January 24, 2018 — February 28, 2018. Performers include: Michael Shannon, Taylor Kitsch, Andrea Riseborough, John Leguizamo, Melissa Benoist, Paul Sparks, Shea Whigham, Rory Culkin, Julia Garner, Demore Barnes, Christopher Stanley, and Camryn Manheim. 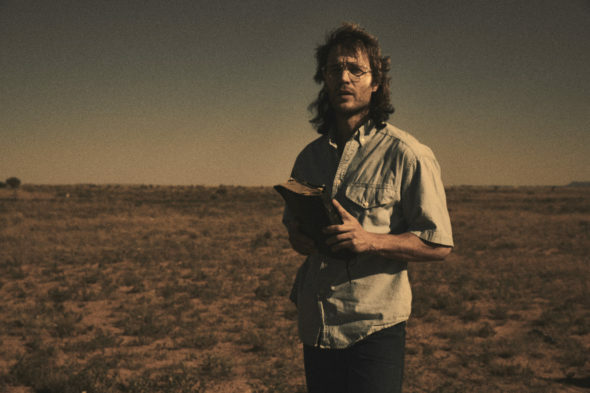 A six-part event series, the Waco TV show is a dramatization of the federal siege on cult leader David Koresh’s Branch Davidian compound, outside Waco, Texas. Creators John Erick Dowdle and Drew Dowdle based it on two biographies, Waco: A Survivor’s Story, by Branch Davidian survivor David Thibodeau, and Stalling for Time: My Life as an FBI Hostage Negotiator, by the FBI’s Head of Crisis Negotiation Unit Gary Noesner. Mount Carmel was a small religious community in McLennan County. In February of 1993, the Bureau of Alcohol, Tobacco, and Firearms (ATF) raided the compound of David Koresh and his disciples, i.e. the Branch Davidians. The protracted gun fight — the longest involving US law enforcement — claimed the lives of four ATF agents and six civilians, with many more wounded during the battle. After a 51-day standoff, between February 28 and April 19, 1993, the FBI initiated an assault which resulted in fire. In the end, the conflagration killed 76 men, women, and children. Charismatic and mercurial, 33 year-old David Koresh (Kitsch) was born Vernon Wayne Howell. He claims to be a second messiah and keeps his faithful followers under his thumb and in his thrall. David and his cult depend on Steve Schneider (Sparks). His gift for recruiting members may be more important to Mount Carmel than the faith, itself. Although he’s one of the Koresh’s closest confidants, Steve has a hard time with the knowledge that his wife, Judy Schneider (Riseborough), is expecting David’s baby. This situation is nothing new for Rachel Koresh (Benoist), David’s first wife. This matriarch of the community has a younger sister, Michelle Jones (Garner), who is also married to Koresh and shares a child with him. A graduate of Harvard Law School, Wayne Martin (Barnes) is father to seven children. He serves as the Branch Davidians resident legal counsel. As a young, agnostic musician, David Thibodeau (Culkin) joins David Koresh’s band. Despite his early days of doubt and hesitancy, after he joins the Branch Davidians, he becomes a true believer. Jacob Vazquez (Leguizamo) is dispatched to the community to gather evidence for a federal case against the sect. During his time there, he starts to feel a connection to Koresh and his flock. Meanwhile, ATF commander Edward Wiggins (Stanley) orders the original raid on the Mount Carmel compound. During the standoff, local radio talk jock Ron Engleman (Lange) doesn’t put much stock in the Fed’s perspective on the situation at Mount Carmel. He offers up his show as a platform for the Davidians to publicize their version of events. An elite FBI negotiator, Gary Noesner (Shannon) tries to allay the Branch Davidians’ suspicions against law enforcement. Meanwhile, he’s dealing with the increasingly impatient tactical division of the Bureau. As the FBI’s tactical commander, Mitch Decker (Whigham) has acquired something of a reputation for bravado. He strongly disagrees with Noesner’s approach on how to draw out the Branch Davidians. During the impasse, David Thibodeau’s mother, Balenda (Manheim) forms a bond with both Noesner and with Koresh’s mother. Eventually, the women will watch their sons’ fates play out on television. There are still many conflicting versions of events about the lead-up to the ATF’s intial raid, and how the standoff unfolded. Using the biographies of both a survivor of the sect as well as one of the Feds on the case, Waco attempts to present the siege in a new light. What do you think? Do you like the Waco TV series? Is a mini-series enough of this story, for you, or does it leave you wanting more? If it were up to you, would Waco be cancelled or renewed for another season on Paramount Network? Perhaps it’s still listed as Spike TV in your listings? If you can’t find it, contact your cable company. Spike TV has shifted into the Paramount Network… Like Trevor said, your cable company may have not indicated the switch on their menu or guide quite yet… But Paramount Network is very much here, available, and ready to show the world what they got.